We are familiar with the oft-quoted Ghanaian proverb, “It takes a village to raise a child.” Sometimes I wonder if we recognize the converse of this truth: “It takes a village to destroy a child” as well. With this in mind, reasonable Black folk must concede that we cannot attach sole responsibility for the miseducation of our youth to negligent Black households. While easy and convenient, this approach fails to assign equal responsibility to our local places of worship, community organizations, and public schools. Of these, the last community resource (public schools) remain convenient targets for those of us working to provide Black children with an empowering education. But if it takes a village, why do we single public schools out when it comes to education? For one, they are THE recognized institution responsible for education in our communities; Secondly, they have trained teachers, administrators and staff (whose salaries derive from our taxes); In addition, schools have budgets, supplies, property, specifically allocated and designated for educating our children. Certainly, this all makes sense, that is until we recognize that the public education system has a hidden agenda for educating Black children that draws its roots from the turn of the 20th century. Putting Friere’s quote into a U.S. context, the U.S. educational system prepares our children to integrate and conform to its culture of values, expectations and views. From the societal standpoint, our children are to assume three primary roles: 1.To become a semi-skilled pool of labor for corporations who will follow instructions without resistance. 2.To become a relatively smaller pool of directors or managers (professional overseers) for the corporate plantation. 3. To become the defenders and enforcers (military and police) of the corporate culture. The first group is designed to generate wealth via their underpaid labor for the corporate elite while the second group coordinates, manages and helps train the first group or uses its higher degree of skill to make more money for the corporate culture. The third group monitors, detains, intimidates and murders critics, rebels and disillusioned citizens who might threaten the corporate culture’s existence and objectives. You will note that all groups must be patriotic, subscribe to bourgeois notions of achieving the “American Dream,” defend and sympathize with U.S. capitalist/imperialist culture, and of course have the basic skills and sensibilities to fulfill their respective functions. Black Nationalists like myself and my comrades in the educational trenches, find the social conditioning and conformity agenda of education unjust and unacceptable. We side with the freedom-oriented and transformative objectives of education. We reject an educational system which produces generations of people who uphold, defend and cooperative with an unjust and exploitive status quo. We seek one that creates critical and creative thinkers and problem-solvers who work to create a just society. We want competent and compassionate human beings who identify with and advocate for the Black experiences and communities that birthed them. Knowing that the traditional school system – along with the university think-tanks, foundations, and corporate culture that created and maintained it – aims to create people who will maintain the current status quo, we challenge and reject it. We understand that such curricula, schools, and school cultures will keep the current system of white supremacy in place. Our unashamed goal is to dismantle it and prevent it from regenerating. 1. It should reflect our own interests as a cultural nation and be grounded in our cultural history. 2. It should be a process of identity development within the context of Pan-African kinship and heritage. 3. It should provide for the inter-generational transmission of values, beliefs, traditions, customs, rituals and sensibilities along with the acknowledge of why these things must be sustained. 4. It should teach children how to determine what is in our interests, distinguish our interests from those of others, and recognize when our interests are consistent and inconsistent with those of others. 1. 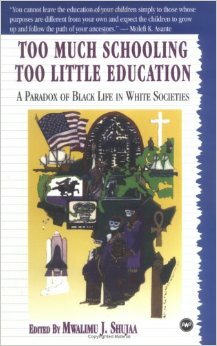 Because true African-centered curricula and schools go against the social conditioning agenda of U.S. education, they face intense scrutiny, monitoring, and lack of support from “mainstream” society who will label them as “reverse racist,” “separatist,” and even “terrorist.” Such schools therefore, will need to seek private funding and avoid any government support. They will most likely need to be private and independent, and charge tuition to cover expenses. 2. There are not enough Afrocentric schools to accommodate all or even 10% of the school-aged Black children and youth in the United States: According to the National Center for Education Statistics, in 2014, approximately 7.7 million Black children attended public elementary and secondary schools. From my internet search, I could only identify 37 African-centered schools in the entire country and I could not verify that all of them are still open, or are in fact, truly African-centered. It will likely take decades to close this gap. In the meantime, this means the overwhelming majority of our children will attend traditional public schools. Yet, all hope is not lost. We should begin a rigorous campaign to create viable independent and African-centered schools. But at the same time, we need courageous and qualified Black teachers to continue working in existing public schools, providing our children with a conscious alternative to the brainwashing and social conditioning they receive. We also need to create more viable after school programs and liberation schools in our community centers and places of worship. Our churches, mosques and temples own property and have already-established congregations/members, many of whom have expertise in several important fields in additional to professional resources. Another excellent options is community homeschooling. Congregants should challenge these institutions to create such programs. Brother Markus Kline has created 3 successful homeschools called Freedom Home Academy in Chicago which house several students, and provides a rigorous academic and African-centered education. Students learn 3 languages (Arabic, Swahili, and French) and ADVANCED academics. All students demonstrate accelerated learning. Why can’t we create schools like this in every U.S. city? See brother Kline discussing his concept below. 3. Even when we create a larger number of African-centered schools throughout the country, who will form the important cadre of teachers and administrators? How do we make sure these individuals remain true to the pedagogy of African-centered curriculum, discipline, and education? How do we prevent the ever-present tendencies of bourgeois values (materialism, individualism, profits over people, pro-imperialist thinking) or patriarchy from creeping into and sabotaging our schools, staff, and students? The not-so-subtle answer is that we must create national or regional institutions that recruit and properly train Black people to teach and run African-centered schools, and institutions that accredit such schools. Simply being a Black teacher does not designate a person as African-centered or even “conscious,” and simply having all Black faculty, staff and students does not characterize a school as being “African-centered.” Educators in these schools will need to understand the “Developmental psychology of Black students” (Amos Wilson), African-centered education, and be able to develop disciplinary, management, and instructional methods consistent with this. We must provide parents with the capacity to determine if any school is certifiably African-centered beyond just a name or claim. In closing, Black Nationalists like myself always argue that “We can’t send our children to receive education from our enemies.” Yet, I should remind you that Marcus Garvey, Elijah Muhammad, Ella Baker, Malcolm X, Fred Hampton, Kwame Ture, Assata Shakur, George Jackson, or most of our most radical and committed Black Liberation leaders did not attend African-centered schools. They either attended segregated Black schools or integrated schools. In either case, neither brand of these schools were African-centered by our contemporary definition. The creation of African-centered schools was a direct product of the Black Power Movement. Most of these schools did not appear until after the 1970s and later. This means that while African-centered schools are the preferred ideal, our children need an empowering education NOW and we cannot afford to wait several decades to accommodate all of them in such schools. However, we can still help our children emerge competent, committed, and conscious even in the framework of the existing school system if we seriously reconfigure and maximize educational capacity within the larger community VILLAGE that raises them. Previous Previous post: It’s Time to Eliminate All Confusion, Illusion, and Distractions, Black People! Next Next post: What Does Revolutionary Black Love Look Like?